Sherina is a Redguard barbarian who offers advanced Blade training at the Leyawiin Fighters Guild, but will only offer her services to members of the Fighters Guild. 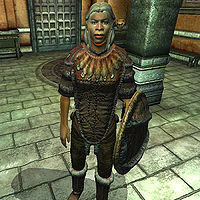 Instead of carrying out contracts, Sherina prefers to stay in the Guild Hall to improve her skills with a blade. She sleeps in the third floor of the Guild every night between midnight and 5am, and once she wakes up she spends the next hour wandering around the ground floor. When the clock strikes 6am, she heads to the balcony of the second floor, where she will spend the next four hours training with her fellow guild member S'kasha. At 10am she stops sparring to take a two-hour stroll around the ground floor, and once done she will find a good place where she can sit to have her breakfast for the following two hours. After she has finished her meal, she will head to the training room on the second floor where she will continue to improve her blade skill with a training dummy for three hours. At 5pm she will leave the room to roam around the ground floor again, before she starts seeking an available chair where she can sit to have her dinner until 9pm. Once she has finished eating, she will wander around the Guild Hall for a brief period of three hours, before she heads to her room on the third floor to sleep. Sherina's training services will be available at any time of the day, except when she takes her breaks to eat or sleep. Sherina's equipment consists of a fur cuirass and boots, combined with a pair of huntsman leather pants. She is armed with a steel shortsword and a fur shield, and also carries her night outfit, which includes a huntsman vest and moccasins, along with a small amount of gold. She seems to be a very laid back person, as you will notice when you speak with her for the first time: "Hey, baby? You fancy some training? Sherina's the name, and blades are the game." On the topic of Leyawiin, she can refer you to the local smith Tun-Zeeus and his smithing skills: "If you need a blade, go see Tun-Zeeus at the Dividing Line. Does repairs, too. He does go on and on, sometimes. But he's the Genuine Orc in Leyawiin." Sherina's skills with the blades are a common topic among the townsfolk of Leyawiin, as they will comment: "Sherina is good with a blade. She knows it, too." and "Fighters Guild members have been going to Sherina to learn blade skills. She's so good, and she'll be the first to tell you so." As an advanced trainer in Blade, she can give the reference to the master trainer. Once your Blade skill has reached 70, speak to her about "Training" and she will tell you: "If you're looking to learn even more, experience is your best bet. If you want pointers, I heard that Alix Lencolia is somewhere in Cyrodiil. Don't tell me you've never heard of him! He's famous for his skill with a blade. And at his young age... He'll be a legend one day, mark my words. I heard that he was on his way to one of the Southern provinces, seeking fame and fortune. Maybe try an inn along the way, like Faregyl." Blade Training: Prove your reputation with a blade to the Master Swordsman. This page was last modified on 20 October 2015, at 05:47.